In Britain during the Second World War, one of the first noticeable changes in dress was the number of people - both men and women - wearing uniform. 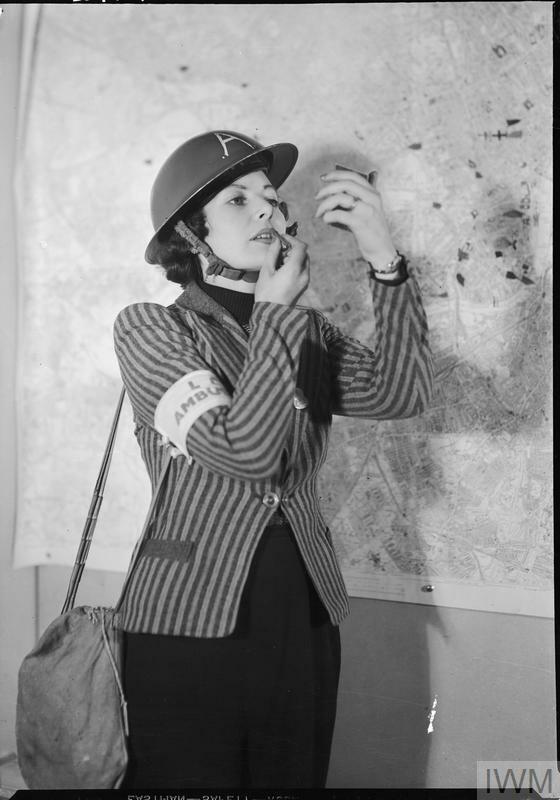 Around a quarter of the British population was entitled to wear some sort of uniform as part of the armed forces, women's auxiliary forces or one of the numerous uniformed voluntary services and organisations. This increased demand for uniforms put enormous pressure on Britain's textile and clothing industries. Both raw materials and labour had to be directed away from civilian production to ensure that the demand could be met for uniforms and the many other military uses of fabric, from tarpaulin to tyre components. Commitments by shoe and boot manufacturers to produce footwear for the services contributed to shortages of civilian shoes. Even the armed forces themselves were affected by shortages. By 1940, 'Battledress' had become the standard field uniform for the Army, replacing the earlier service dress. The 1940 pattern battledress (blouse pictured here) was sometimes referred to as the 'utility pattern' as its design had been modified to make it more efficient to produce. The concealed buttons of the fly front, cuffs and pockets were replaced by exposed buttons and the pleats on the breast pockets were removed. The British government needed to reduce production and consumption of civilian clothes to safeguard raw materials and release workers and factory space for war production. The imposition of clothes rationing was announced by Oliver Lyttleton, President of the Board of Trade, on 1 June 1941. Making the announcement just before a Bank Holiday allowed the Board of Trade time to brief retailers before the shops reopened. The news came as a complete surprise to most people. 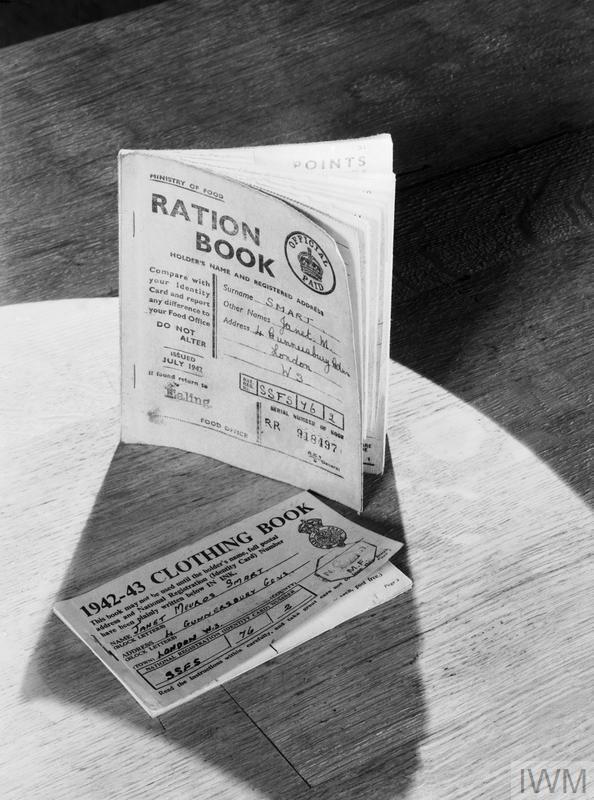 As with food rationing, which had been in place since 1940, one of the other reasons for introducing civilian clothes rationing was to ensure fairness. Rationing sought to ensure a more equal distribution of clothing and improve the availability of garments in the shops. The rationing scheme worked by allocating each type of clothing item a 'points' value which varied according to how much material and labour went into its manufacture. Eleven coupons were needed for a dress, two needed for a pair of stockings, and eight coupons required for a man's shirt or a pair of trousers. Women's shoes meant relinquishing five coupons, and men's footwear forced the surrender of seven coupons. When buying new clothes, the shopper had to hand over coupons with a 'points' value as well as money. Every adult was initially given an allocation of 66 points to last one year, but this allocation shrank as the war progressed. The coupon allowance was at its lowest from 1945 and 1946. For the eight month period from 1 September 1945 to 30 April 1946 only 24 coupons were issued, effectively allowing the shopper only 3 coupons a month. Throughout the war, special provisions were made for some people, including manual workers, civilian uniform wearers, diplomats and theatrical performers. New mothers were also given 50 coupons. 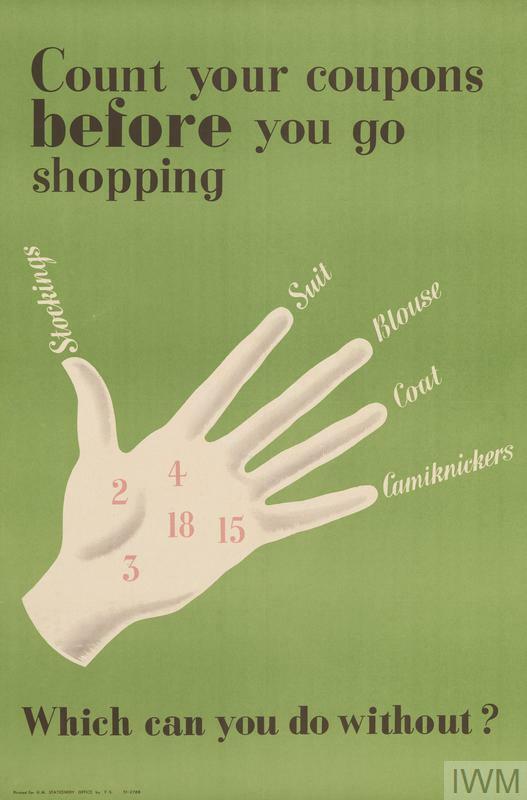 Government publicity offered advice about the complex rationing system. Shoppers were constantly reminded of the need to plan their clothes purchases carefully and make difficult choices between garments of differing coupon values, as seen in this poster. Children's clothes had lower coupon values in recognition of the fact that they would need new clothes more often as they grew. From 1942, all children were allocated an extra ten coupons, with additional coupons being issued for older children or those classed as 'outsize'. Coupons were also needed for school uniforms, which could be a particular problem as many schools did not relax their rules on uniform during wartime. Clothing exchanges were set up by the Women's Voluntary Service (WVS) to help meet the needs of women struggling to clothe their families. Women could take the clothes that their children had outgrown and were given a number of points for the clothes she handed in. These could be 'spent' on other clothes at the exchange. As this poster illustrates, mothers were also encouraged to buy children's clothing in bigger sizes so it could initially be taken in and then let out gradually as the child grew. The 'Make Do and Mend' campaign was launched to encourage people to make their existing supplies of clothes last longer. Clothes care was a key part of the Make Do and Mend message. Posters and leaflets were circulated with advice on subjects including how to prevent moth damage to woollens, how to make shoes last longer or how to care for different fabrics. As the war went on, buying new was severely restricted by coupon limits and no longer an option for many people. The ability to repair, renovate and make one's own clothes became increasingly important. Although shoppers would have to hand over coupons for dressmaking fabric as well as readymade clothes, making clothes was often cheaper and saved coupons. Make Do and Mend classes took place around the country teaching skills such as pattern cutting. Dress makers and home sewers often had to be imaginative and experimental in their choice of fabrics. Despite disliking much of the official rhetoric to Make Do and Mend, many people demonstrated great creativity and adaptability in dealing with rationing. Individual style flourished. Shortages necessitated imaginative use of materials, recycling and renovating of old clothes and innovative use of home-made accessories, which could alter or smarten up an outfit. Many women used furnishing fabrics for dressmaking until these too went on the ration. Blackout material, which did not need points, was also sometimes used. Parachute silk was highly prized for underwear, nightclothes and wedding dresses. The introduction of rationing did not make clothes cheaper. Money was still needed to buy clothing, and they were often expensive with prices rising during the war. Every type of clothing item had the same points value regardless of quality. Wealthier shoppers could afford to buy robust clothes which would last. The less well-off had to use the same number of coupons for a cheaper garment of the same type that might wear out in half the time. 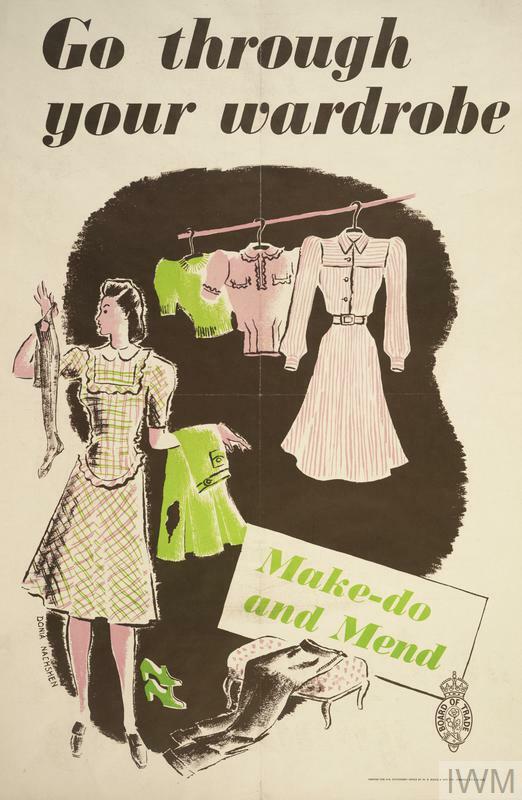 Similarly, although the Make Do and Mend campaign suggested ways to repair and recycle old clothes, cheaper clothes inevitably wore out more quickly than more expensive and better quality clothing. The government introduced the Utility clothing scheme in 1942. It aimed to deal with this problem by offering consumers a range of well-designed quality and price-controlled clothes affordable for all. The Utility scheme also developed out of a need to standardise production of materials and make factories more efficient to free up more resources for the war effort. Strictly-specified Utility fabrics, and clothes made from these materials, gave the public a guarantee of quality and value for their money and coupons. In wartime Britain it became 'unfashionable' to be seen wearing clothes that were obviously showy, yet women were frequently implored not to let 'standards' slip too far. There was genuine concern that a lack of interest in personal appearance could be a sign of low morale, which could have a detrimental impact on the war effort. The government's concern for the morale of women was a major factor in the decision to continue the manufacture of cosmetics, though in much reduced quantities. Make-up was never rationed, but was subject to a luxury tax and was very expensive. Many cosmetics firms switched some of their production to items needed for the war effort. Coty, for example, were known for their face powder and perfumes but also made army foot powder and anti-gas ointment. Make-up and hair styles took on an increased importance and many women went to great lengths to still feel well-dressed and stylish even if their clothes were last season's, their stockings darned and accessories home-made. As with clothing, women found creative ways around shortages, with beetroot juice used for a splash of lip colour and boot polish passing for mascara. Aspirations and hopes for the future were a dominant theme in many of the government's public information campaigns after the war had ended. In this saving scheme poster from 1945, a new outfit is presented as a post-war dream purchase. Most British people hoped for an end to rationing restrictions in peacetime. Rationing lasted, albeit in a gradually reduced format, until March 1949 and many of the changes brought about by war continue to shape fashion today. Developments in large scale garment manufacturing helped to accelerate the growth of mass market fashion, which in turn helped department stores to flourish. 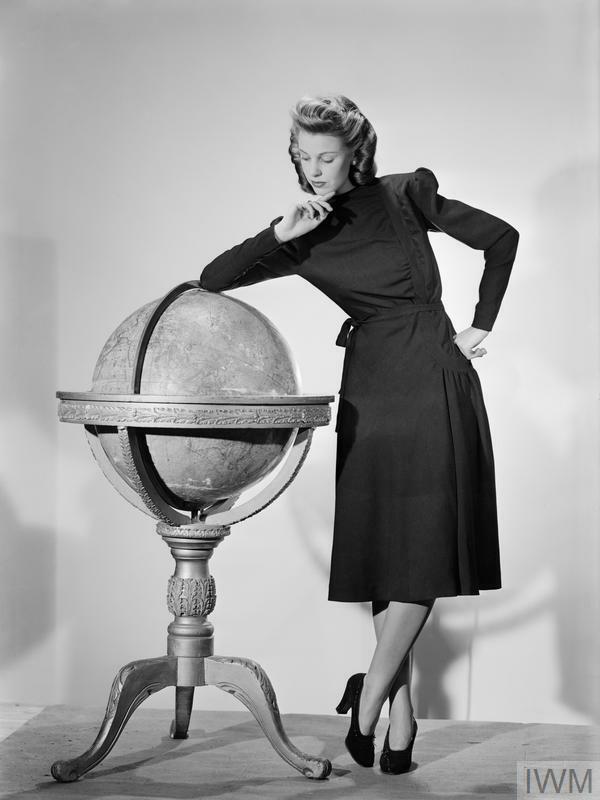 The trend towards a more relaxed and informal style of dress also gathered pace in wartime. The Utility scheme ended in 1952, but it had given consumers new confidence to demand value for money and led to regulated standards in materials and manufacture. Through the Utility scheme, high end fashion designers produced styles for the mass market for the first time. This is echoed in today's designer 'diffusion' ranges for high street stores. The manufacture of Utility clothes required efficiency in production and less wastage - principles which today align with the desire for sustainability in many companies. In recent years even the concept of Make Do and Mend has had a revival. Crafts such as knitting and sewing are popular outlets for creativity and invention, just as they were in the 1940s. During the Second World War, clothing featuring patriotic designs allowed civilians to 'do their bit' for the war effort without compromising on style. The London-based textile and fashion company Jacqmar was the most notable creator of scarves featuring popular wartime motifs and patriotic messages.